Most of us probably shop at the supermarket when we're looking for a good cut of meat for dinner. The big chain supermarkets stock the most popular, or, at least, the most well-known, cuts of meat like, for example, sirloin, chuck, T-bones, and tenderloin. There are, however, some surprising meat cuts you might never have heard of, but that a butcher loves for their superior flavor, melting tenderness and excellent value. Don't try looking for these special cuts of meat in a supermarket. But if you happen to live near a local, privately owned butcher, stop in and ask him/her about the unfamiliar cuts listed below. Not only will you get personalized service and an amazing steak or braised roast for a great price, but your new friend The Butcher will also offer advice and cooking methods, too. The top sirloin is situated between the loin and the round (the rear of the cow) and is made up of three muscles: The cap, the center and the “mouse” (a fist-sized knob of muscle that's usually trimmed and cut for stir-fry or ground sirloin). The cap is triangular in shape, between one- and two inches thick and covered on the top side with a thin layer of creamy white fat. The cap muscle doesn't get much exercise during the animal's lifetime, so its meat is tender, and the fat layer adds tremendous flavor, self-basting the meat as it cooks. The top sirloin cap is often cut into steaks and grilled, but in Brazil, where it's known as picanha, it's roasted whole on a rotisserie and sliced right off the spit. Picanha is something of an obsession and a national treasure in Brazil, and it's only starting to be discovered in the U.S. Top sirloin cap isn't difficult to cook and needs just coarse salt and pepper for seasoning. 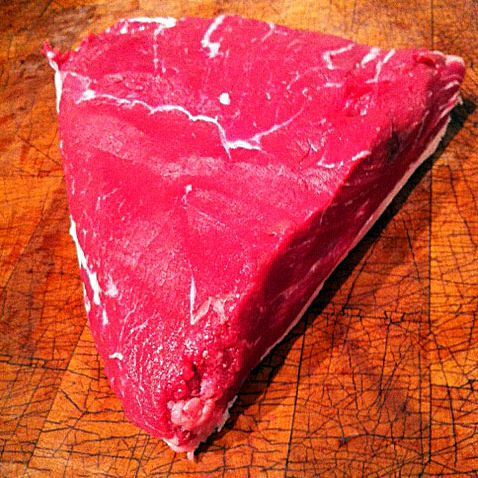 There is only one top sirloin cap per cow, so you'll need to order it a little ahead of time from your butcher. Beef shank is probably one of the most under-appreciated parts of the cow. It's located in the lower part of the leg (the shin), and because the cow works this muscle the most, the shank's tough meat needs to be braised (long, moist heat) to be edible. But a wonderful thing happens to the shank during several hours of braising: The fat and sinew break down, and the meat absorbs all the flavors of the wine and vegetables it was braised in. The beef shank's bone marrow softens to a custard-like texture with a buttery flavor and adds richness to gravies and soups, but it's also delicious eaten on its own. In French cuisine, the beef shank is roasted just for the marrow alone, which is enjoyed spread on large croutons or toast. For the classic Italian dish, osso buco, veal shank is most commonly used, but beef shank is equally, if not more, delicious, and serves twice the portion at half the price. The vacio steak is a wildly popular cut in Argentina. This beef cut hangs beneath the loin and is cushioned by the cow’s belly, so it's protected by layers of fat, which gives the meat-rich beefy flavor. Vacio steak is a tender cut, but it does have some texture, meaning it's got a bit of chew when grilled. It usually weighs between four and five pounds, and like top sirloin cap, it's often cut into individual steaks (as in France, where it's commonly known as bavette). However, grilling vacio steak whole over slow, indirect heat is the preferred method in Argentina. Vacio steak is gradually catching on in North America, so it is not usually available except by ordering it from your butcher. Lore has it that butchers secreted away this cut—the “butcher’s choice”—from customers to keep for themselves, and there's little wonder, as hanger is one of the best steaks for grilling. The hanger steak is attached to the diaphragm, nestled by the kidneys, which imbue the beef with a rich flavor. A cleaned and trimmed hanger steak yields about two pounds of edible meat. Similar in texture to skirt steak, hanger steak should be marinated and grilled rapidly over very high heat. It is usually served rare or, at most, medium-rare, as overcooking will toughen the meat, and always sliced against the grain. In restaurants, hanger steak tends to be pricey, but it's quite an economical cut when purchased from your butcher. Most butchers will have hanger steak available (if not on display, ask), but you should check first since it sells out quickly. Butchers include lamb shoulder in this guide of unfamiliar and under-used cuts because it is both versatile and inexpensive. The cut is located between the neck and foreshanks, and its meat is encased in thin layers of fat and connective tissue that soften when the shoulder is braised or slow roasted. The shoulder’s luscious meat is more delicate and less “gamey” in flavor than the leg or shank and can be used in a number of slow-cooked recipes.